The Phi Phi Islands are about as idyllic as it gets. With pristine, palm-fringed beaches and turquoise waters, it’s no surprise this was the choice destination for the Dicaprio blockbuster. 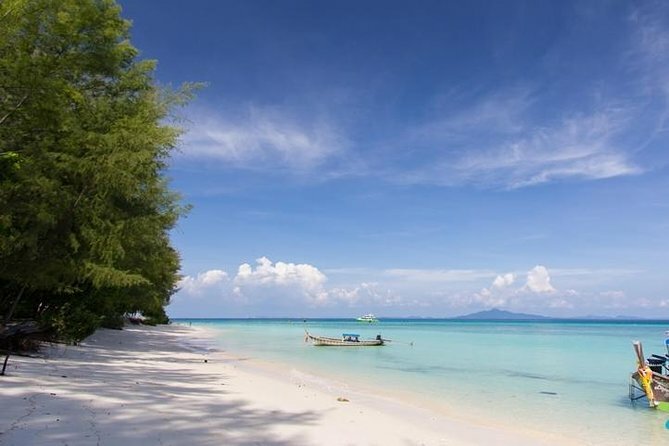 This full day island-hopping trip will first take you to the sparkling sands of Bamboo Island. A private crescent-shaped bay where you can relax on the beach or snorkel beautifully clear waters. Departing for Hin Klang, you’ll be mesmerized by the colorful marine life and coral reef resting just feet below the surface, before heading to Phi Phi Don for a beachside restaurant lunch. A sightseeing cruise will take you past the islands’ fascinating rock formations to where it’s feeding time at Monkey Beach. The most fascinating part of the trip comes in the form of Phi Phi Lay. Here you’ll find the Viking Cave, home to a thriving bird’s nest soup industry and of course, Maya Bay, where you can explore the spectacular setting of ‘The Beach’. 07.30 Pick up at your hotel,transfer to Royal Phuket Marina. 09.00 Depart from Royal Phuket Marina pier. 10.00 Arrive at Bamboo Island to enjoy swimming and snorkeling. 12.00 Enjoy a great lunch at Phi Phi Don Island (Ton Sai Bay). 13.30 Sightseeing Monkey Bay, Viking Cave, Pileh Cove, Loh Samah. 14.00 Sightseeing at Maya Bay where the movie “The beach” was filmed. 14.30 Arrive Monkey Bay Relax on the beach and swim in the crystal clear water. 16.30 Arrive at Royal Phuket Marina,transfer to the hotel.
. *This program is subject to change without prior notice according to the weather and sea conditions. Phi Phi consists of six small islands 46km south of Phuket. Fine sandy beaches give way to soaring limestone cliffs to form spectacular scenery. Add crystal clear water, a refreshing lack of roads, plus a laid-back lifestyle, and it’s easy to see why Phi Phi is one of southern Thailand’s most popular destinations. The smaller, uninhabited island of Phi Phi Leh is a big tourist attraction. Surrounded by sheer limestone walls dotted with caves and passages the island’s shallow blue-green lagoons and coral gardens are a snorkeler’s paradise. The island also has two magnificent beaches, Loh Samah and Maya Bay – used as a location for the Hollywood film The Beach. You have chosen: The date of 25-April-2019, for a price = 86USD. Number of Adults = 1. And this is the final price, no extra VAT, tax, credit card, etc. charges. Our trips are available starting from Phuket and Khaolak. Our transfers in only Patong, Kata, Karon, Chalong, Phuket Town areas are free of charge but other areas in Phuket not stated previously and in Khaolak area, extra charge are applied. If you are pregnant, you may not take part. Please be ready and waiting in your hotel lobby or designated pick-up location 15 minutes prior to your scheduled pick-up time. Weather and sea conditions determine whether the tour operates.